FRANKFURT, Germany -- The European Central Bank cut a key interest rate and extended its stimulus program to bolster the 19-country eurozone economy on Thursday — but the actions underwhelmed investors who pushed stocks sharply lower. The main move by the ECB, which sets monetary policy for the 19 countries that use the euro currency, was to cut the interest rate on deposits from commercial banks from minus 0.2 percent to minus 0.3 percent. Cutting the rate is intended to push banks to lend excess cash by imposing a penalty on the deposits they park at the central bank. But many in the markets had predicted a bigger cut to minus 0.4 percent. And alongside other measures, ECB President Mario Draghi said the bank will extend the duration of its bond-buying program, which aims to make borrowing cheap in the wider economy. Draghi said the program, which was due to expire in September 2016, is now intended to run until March 2017 or beyond if necessary. Though the program has been extended, which will increase the size of the overall stimulus from the previous 1.1 trillion euros ($1.2 trillion), the monthly cap of 60 billion euros in purchases was maintained. "Today's decisions were taken in order to secure a return of inflation rates toward levels that are below, but close to, 2 percent and thereby to anchor medium-term inflation expectations," Draghi told reporters at a news conference. The ECB's moves prompted frenzied reactions in financial markets — the euro jumped 2.4 percent to $1.0861. Earlier in the day it had been pushing down toward $1.05 and there were some predictions that that it was heading toward $1.00. In stock markets, the moves were equally sharp. Having spent most of the day higher, European stock markets plunged. Germany's DAX was down a whopping 3 percent while the CAC-40 in France slid 2.6 percent. 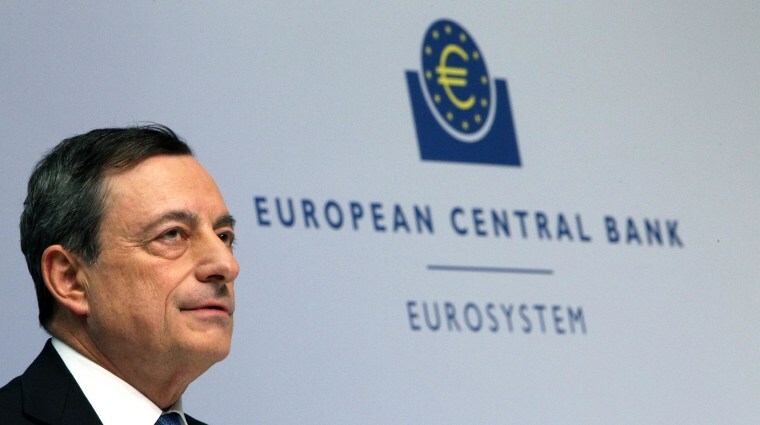 "This has been a huge failure from the ECB," said James Hughes, chief market analyst at GKFX. "Much more was expected." Draghi said the decisions were not unanimous but that there was a very large majority in favor of the moves. He said the deposit rate cut was "adequate." "I don't think our communication was wrong," he said. "I think these measures need time to be fully appreciated." The ECB wants to raise annual inflation toward its goal of just under 2 percent as part of its legal mandate to maintain price stability. Draghi said there are "continued downside risks" to the inflation outlook. The ECB cut its forecasts for inflation next year, to 1 percent from 1.1 percent previously. "The persistence of low inflation rates reflects sizeable economic slack weighing on domestic price pressures and headwinds from the external environment," he said. Low inflation can help consumers by making their euros go farther. But it is a sign of weak demand, and can lead to chronic stagnation if people begin anticipating flat or falling prices in purchasing decisions and wage agreements. Weak inflation of the sort prevalent in the eurozone makes it harder for the currency union's indebted members such as Greece to reduce their burdens and to bring their business costs down relative to their eurozone trade partners — a necessary step in their economy recovery. The eurozone economy as a whole grew by a moderate 0.3 percent in the third quarter, while unemployment is falling but only gradually from high levels. Draghi said the economic recovery should proceed but that it "continues to be dampened by subdued growth prospects in emerging markets and moderate global trade, the necessary balance sheet adjustments in a number of sectors and the sluggish pace of implementation of structural reforms." The ECB's current policy path contrasts with that of the U.S. Federal Reserve, which has ended its own bond purchase program and is expected to start raising interest rates from near zero at its next meeting Dec. 16.